The main event of the year organised by the Sports and Social Club is the Annual Christmas Dinner & Dance.This venerable institution has been running its predictable and much-criticised course for as long anyone can remember (though judging by the state of most the clerks the day after, it's a wonder they can remember anything). The committee, chaired by the unflagging Hickford, has a varying degree of committment to the Dance and goes through with it despite their true feelings shown in strip 5538. When the speeches begin there is a mass rush for the bar. A barrage of bread rolls meets speeches from the top table. The speakers fortify themselves with alcohol before taking their places. Peterson of Public Relations launches a swingeing attack on the food, the decorations and entertainment and is ejected with the traditional cry "And stay out". A number of committee members station themselves by the doors (not to prevent gatecrashers but to stop anyone leaving early). Sir Reginald Chester-Perry is always invited to attend and sadly, is always unable to do so. The inevitable reason is that he has rearranged his holiday schedules to overlap with the date of the Dance, regardless of when it takes place. This does not deter the committee from trying again each year, with ever more desperate suggestions for enforcing his presence. Doubtless the reluctance of the firm's founder to participate is related to his experiences on the only occasion, in 1968, that he did attend the bunfight. Robin Chester-Perry did attend the odd do but after his marriage to Fiona Myles he has found better things to occupy his time. A wonderful example of the relationship between staff and bosses comes one year when after the formal toasts the attendees are invited to cross toast. Originally the Christmas do was a simple dance where the most sophisticated event was the hokey-cokey. It was upgraded to a Dinner and Dance in 1967. Here are some of the “highlights” of this grand institution. It normally takes place in the firm’s canteen but there are exceptions, particularly in the early years. Frank Dickens’ illness in November 2010 means that our record must, sadly, terminate with the festivities in 2009. Pedants might question if the Dinner and Dance is a company event or a private event organised by the Sports & Social Club. The attendees tend to refer to it as the “firm’s Christmas dance”. And there is one time when Bristow suggests that attendance is compulsory. Be that as it may, it is the Sports & Social Club, under the “leadership” of Hickford, that is charged with the responsibility of organising it. There is no reference to a Sports and Social Club Christmas event this year. Instead, in strips published in the Aberdeen Press and Journal, (not in the Evening Standard) they hold a “kiddies party” – it is not clear whether these are the offspring of Chester-Perry employees or just kids unfortunate enough to be in the vicinity – and Bristow, keen in those days to help as a means to advancement, is the chief washer-upper. He is pleased when Fudge summons him the day after – alas, the praise that is his due is supplanted by a bill for crockery breakages. 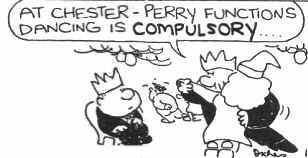 The first mention of the Dance is in strip 563, on 3 December. Before: The charm of the typists does not impress Bristow. There appear to be no other available women attending. Sunman seems keen that Bristow goes. During: Delighted that no senior managers are there, the staff have a jolly good time. Before: The typists rib Bristow about being their partner. During: Bristow bemoans the ugliness of the typists, and having complained that all anyone does is talk shop, refuses to fraternise with anyone outside the Buying Department. Venue: Not specified, probably the Assembly Rooms again. Before: Bristow dodges the typists and seems taken aback when advised to change out of his regulation black jacket and striped trousers. Before: Bristow, studying the typists as usual, wonders if it is worth going at all. During: The glorious view of the Chester-Perry Building drives everyone to drink. The MC, Peterson of Public Relations, becomes aggressive, starts a fight and is thrown out. Sadly, this pattern is to become all too familiar. Before: Bristow, unhappy about the choice of venue suggests holding it in the Buying Department, if not around (or even on) his desk. During: The paltry decorations do not impress, nor does the uncanny similarity of the Musical Chairs game to the normal lunchtime scramble for a seat. Bristow attempts to impress by ordering a round of drinks. It being the firm’s canteen, everything is off. Post-Mortem: The amount of damage inflicted on the canteen makes Bristow assume it will never be held there again (wrong!). The first time that a Dinner is appended to the Dance. No convincing reason for so doing is given this year or indeed since. Before: Miss Rouge regrets that dinner speeches go on and on and on and on and on (unlike her good self). Hewitt angrily declines to attend on the grounds that it amounts to unpaid overtime. Oddly enough his name appears on the seating plan. During: Bristow invites a typist – any typist – to dance. He is rejected, as he knows he will be, with contumely. Post-Mortem: Bristow decides against lunching in the canteen, knowing that the menu will consist of the previous night’s left-overs. This is notable for two things - Hickford, after trying, as he tell us, for ten years, persuades Sir Reginald to attend. And master chef Mr. Gordon Blue takes charge of the catering for the first time. During: Bristow finds his place on the seating plan is as far away from the top table as is physically possible. The canteen is so full that chairs from the main building are brought over. Bristow moans that that they forgot his cushion. Every part of the meal is subject to withering criticism. Sir Reginald does actually attend, together with a Mr. Musgrove the works manager. Mr. Blue acts as MC as well as chef. Before: Bristow lists all of his colleagues who are attending to the typists, whose raspberry is heartfelt and spontaneous. But then it is learned that Robin Chester-Perry, still unmarried and heir to the C-P millions, is attending and all hell breaks loose in the pool. During: Bristow generously buys a round, as he needs to break a £5 note anyway and is handed 3d change (cue “sob”). A Mr. Walmsby-Smith makes a speech that is greeted by a barrage of bread rolls (the first time this time-honoured custom is mentioned). Someone very senior (Sir Reginald?) leaves and at once everyone else is on the dance floor. Post-Mortem: Buying clerks share happy memories, especially of the bread-roll chucking. Before: Hickford thought he had secured the Brolly & Bowler, the local pub, as the venue but is double-crossed by Gun & Fames. He is delighted to tell the committee that Robin Chester-Perry has granted permission to use the firm’s canteen. His colleagues evince a certain disdain. Bristow is given the job of informing Gordon Blue that his services will once more be required. This permits a devastating round of food-based puns. The committee also decide to scrap the live band and have a disco. It is not clear why Miss Rouge is “assisting” with the disco by undertaking to talk between the records. None of the Chester-Perrys are coming, nor are any of the top management. Post-Mortem: Bristow gives Hickford a scathing compendium of criticisms. Before: In October, the committee cunningly outwit those calling for a change of venue. The resolution is put to a membership so dyspeptic after a canteen lunch special that no-one can raise their arm to vote against. During: For some reason the men decide to spice up their appearance by using the suntan lounge at the City Sauna. All except Atkins, whom Bristow hails across a crowded room as “Dr. Livingstone, I presume”. There is a grand raffle with fifty prizes. Bristow is unimpressed with the first prize, a cigarette lighter, and with the last, a clerkship in the Buying Department. Once again Mr. Blue’s cuisine does not impress and bread rolls are reserved for the moment he takes his bow. Post-Mortem: Apart from condemning the food, the speeches, the band, the Glee Club (how did they get in there? ), the price of the drinks and the price of the raffle tickets, the diners seem to have enjoyed themselves. Before: Tickets go on sale curiously late and Bristow is taken aback by the price. The dress code is relaxed. Sir Reginald accepts a number of invitations to banquets with various institutions, except a certain one from the Sports and Social club. During: The committee had hoped to book the banqueting hall at the Brolly & Bowler. But it was an error of judgement to ask Peterson of Public Relations to act as negotiator. The firm’s canteen it is. Bristow takes avoiding action when seated across the table from Bessie Bland “the ugliest woman in the firm”. Mr Blue’s hopes of a standing ovation for his food are dashed when the throng demand instead supplies of tomato ketchup. Post-Mortem: Bristow arrives at work with memory loss and a hangover. Everyone makes admiring comments about something he did, the sly dog. He cheers up. Before: Curiously, Bristow starts selling tickets and encouraging others to go - “the hard sell starts with a smack in the mouth” in late November. Sales pick up when he announces that he is not going himself, but this is revealed to be a joke. Bristow’s old fashioned tastes in music contrast with the up-to-the-minute post-boy. During: Bristow is disappointed to find that, whilst his colleagues are seated next to such interesting characters as Natalie (“the firm’s sexpot”) and Mr. Gabby (“the firm’s raconteur”), his partner is the hitherto unknown Fatty Steadman (“the firm’s pig”). A disturbance at the door is put down to gatecrashers (“they’re not trying to get in, dum dum, they’re trying to get out”). Bristow complains about the food to Mr. Gordon Blue who puts his trust in everything turning out alright on the night. Post-Mortem: Bristow describes the night as the best yet, the highlight clearly being drowning out the speech of Mr. Pettigrew (filling in for the unavoidably absent Sir Reginald) with a barrage of bread rolls. Before: Sir Reginald finds time to have dinner with the Prime Minister and the Lord Mayor, amongst others but sadly is not able to attend the C-P dinner and dance. His secretary rashly suggests that he might go just this once and is nearly brained by a paperweight. Mr Blue prepares his usual sumptuous feast of turkey and all the trimmings for 748 guests, and his staff order 748 bottles of tomato ketchup. Jones finds many reasons to despair of the whole event in the hope that reality may be slightly better so he won’t be let down. During: The first speech is given by a Mr. Carruthers – his top-table colleagues are unable to concentrate on it as they prepare for the bread-roll assault. Bristow turns down the hopeful advances of Miss Sunman. Post-Mortem: Bristow arrives at work to find his office devastated. He is even more devastated when reminded that he was the one with the bright idea to get things going with a conga. Before: The committee decide to rid the dinner and dance of “undesirable elements” (could this be a reference to Bristow?). They resolve to double the ticket prices. They are then somewhat surprised to find that nobody wishes to attend. A typist leaves the firm to get married and, following Bristow’s brainwave, is presented with two tickets to the D & D. When it is time for Bristow to buy his own ticket, he is mollified to find that a bottle of tomato ketchup is included in the price. He is less impressed to find that he is seated, not with his buying department colleagues, but a group of people whose surnames he fails to recognise. They turn out to be the post-boy, lift-boy, janitor, tea-lady, car park attendant and the firm’s messenger. During: Before dinner is served there is a roll-call to ensure everyone has turned up. A diner voices his considerable objections to the meal and is ejected – thus terminating Peterson of Public Relations’ interest in the proceedings. The guest speaker is Mr. Houghton of Transport whose speech evokes the heaviest bread-roll barrage so far seen. After dinner Bristow foolishly buys a round of drinks, wiping out his lunches, fare money, tea money, laundry money and cinema for the following week. More before: Learning that Sir Reginald intends to sail on his winter cruise on the 14th December, the committee cunningly bring the date of the dinner and dance forward a week, thus guaranteeing his attendance. Sir Reginald with even greater cunning brings the date of his cruise forward and is safely in the southern Atlantic in good time. Before: Bristow prepares for the dance with a bulk order from Joe’s Joke Emporium. Most of his colleagues reluctantly agree to attend because there is nothing good on the telly that night. Before: The committee meticulously plan for the big night but know that all may not go as intended. During: Mr Blue empties his kitchens of tomato ketchup. His guests bring their own. Bristow is placed on a table of strangers who not only listen to the speeches with interest; they actually eat their bread rolls and leave none for throwing. Very much before: The committee invite Sir Reginald to attend, cunningly issuing their invitation in April. Sir Reginald, unfortunately, finds he has only just accepted another invitation for that very night. Before: Bristow and his fellow clerks decide to go to the dance dressed as John Travolta, the disco king. As his style is to wear black jacket and pin-stripe trousers, apparently, this enables them to wear their normal working clothes. During: The speeches are given by Roderick and Charles. The bread-rolls start flying the moment Roderick foolishly leads grace – “For what we are about to receive”. Charles then disconcerts him by suggesting he keeps his speech short because there is Punch and Judy coming up. Before: Sir Reginald pre-empts the committee by declining their invitation before they issue it. Nonetheless the sale of 764 tickets forces the committee to go through with the event. To liven up the music, Elvis Boggis Travellin’ Music is contracted to supply the disco. Elvis and his partner find the C-P mob somewhat daunting. During: Bristow leads the entire staff in toasting order 4272406. All, that is, apart from the bemused top table – “is there something we don’t know?” The selection of Toady Thompson to manage the raffle provokes thoughtfulness as he awards each prize to one of the Directors. Before: Bristow decides to wear his normal clobber, including velvet collared drape jacket, drainpipe trousers and blue suede shoes. During: The speakers fortify themselves with considerable amounts of alcohol before leaving the safety of the boardroom. Mr. Blue, seeking to bask in the approbation of his diners, finds most of them hastily shovelling the leftovers into doggy bags. Before: The committee determine to crack down on hooliganism. Some of the clerks feel it is hardly worth going. Before: The committee are unhappy when they realise that Bristow has found about the dinner and dance. Before: Bristow leaves his decision about attending to the last minute – literally, to 4:59pm on the day. During: Once again seated opposite the ugliest woman in the firm (not named as Bessie Bland in this one), Bristow decides to keep his coat on “- I'm not stopping”. Post-Mortem: It must have been a good night, judging by the groans coming from the Buying Department the next day, and the demand for black coffee throughout the firm. Before: Toady Thompson reports sick due to over-excitement at the announcement of the date for the dinner and dance. Bristow wisely packs a flask, magazines and a solitaire game in preparation for the evening. Sunman, pretending she cannot go, traps Bristow into admitting that he is. During: Bristow impresses his fellow diners with singing, dancing and flirting. But when Atkins asks for a repeat, we find our hero recumbent under the table. Venue: The Rising Sun banqueting rooms are chosen in preference to the firm’s canteen. Before: Sir Reginald declines to acknowledge an invitation from the committee to attend the dinner and dance. The committee ask their wine tasting committee to sample the wines chosen for the event, but have to adjourn when the chairman is found under the table. Tickets go on sale and Bristow is taken aback at the price (£10). The Home Secretary drafts in 500 extra police to ensure public order. Before: Sir Reginald bins the Sports and Social club invitation. Jones inveigles Bristow into going with the promise that they can talk shop all night. Bristow antagonises the typists with his usual objections to the standard of pulchritude. Sunman takes Bristow’s “well, er” response when she asks about the Last Waltz as an eager acceptance. Before: The price of the tickets induces a fit of the vapours in Bristow. He is warned that security is being stepped up and that latecomers will find the doors hermetically sealed. During: Bristow’s seat is placed, as seems to be traditional, as far away from the top table as possible. Amongst his dining companions is Toady Thompson, who yearns to be at, or at least nearer, to the elite on the top table. Sunman pulls the wishbone with Bristow. She wishes he would take more interest in her. His thoughts – “she should be so lucky”. Before: Sir Reginald plays a cruel joke on the committee, saying he will indeed say a few words at the dinner and dance, but planning secretly to cancel just before. However nobody on the committee, with the exception of the gullible chairman Hickford, believes him. Post-Mortem: Bristow enjoyed it – the bread rolls were flying. Before: Someone at the Sports and Social club committee dares to suggest that it is not worth bothering to invite Sir Reginald – but this glimmer of reality is shouted down. Jones laments that the music is to be replaced by karaoke. During: Bristow is delighted to be seated with the firm’s cashiers. They appear to be a somewhat suspect bunch of ex-cons. Post-Mortem: Bristow is pleased to have come second in the raffle, karaoke and musical chairs. But Jones has the smug smile of a winner. Before: Bristow promises to fix it that Sir Reginald will attend, his innocent victim being a hitherto unknown Mr. Proby. Sir Reginald reacts badly to the invitation and resorts to law. Sunman forces Bristow to buy a ticket at a cost of £10, he submits knowing that his wages will docked otherwise. During: The dress code has been tightened – hard hats and overalls are out. Bristow is seated next to Muscles Maddox, the firm’s bully. Maddox has a wonderful time. Bristow suffers. Sunman tries to get him dancing but he has an excuse ready. Before: Bristow threatens to attend with a diamond in his nose and sporting an earring. Jones trumps this by dragging out his old 50s gear, drainpipe trousers, bootlace tie and all. Hickford delicately reminds Bristow that, never mind buying this year’s ticket, he still owes for the previous year. During: Bristow relishes the stupefying dull chat about invoices and orders, letters and requisitions of his fellow clerks. Before: The 1992 dress code is restated. During: Seated opposite Sunman, Bristow makes skilful use of the table decorations, rather cruelly thinking “I don't want to look at that face all evening”. He has another clever excuse ready to avoid dancing with her as well. Before: The committee abandon the attempt to persuade Sir Reginald to attend. Once again Sunman entraps Bristow into admitting that he is going. During: Bristow orders the post-boy to get on his feet and dance. Before: There is now a behaviour code in which cycling, skateboarding and ball games are banned. Before: The committee consider drugging Sir Reginald and bringing him to the dinner and dance by force. Before: Hickford approves the design of the tickets “not a patch on the forged ones but they will have to do”. Sunman gets over excited. Bristow plays it very cool. Before: Bristow, hesitating about buying a ticket, is warned that his absence might threaten his career. Before: A Sports and Social committee man dares to tell his colleagues they are stupid to think Sir Reginald will ever attend. He is expelled forthwith. Jones and Bristow bemoan that hard hats are now acceptable wear. During: It is difficult to get into the canteen due to people having a look before deciding whether to go in. Jones tries to set up Bristow with a suitable young woman but he loses her to a dashing cavalry officer (Atkins in disguise). Post-mortem: The punch-up at the dance interests Sky Sports who want to buy the film rights. Bristow explains that alcohol was the root of the problem “Invoicing were pie-eyed when they arrived”. Sunman clearly had a great time “every girl should be fought over just once in her lifetime”. A scapegoat is found to carry the can for the debacle – this is presumably Mr. Meeke. Before: The dinner and dance is brought a week early so the organisers can escape the country before Christmas. Sunman is delighted because if she falls in love she has more time to sort out her Christmas. Post-mortem: The dinner was greatly enjoyed by one individual who managed to do work with the people sitting near him than in the whole of the previous year. Astonishing post-post-mortem: Miss Sunman and Toady Thompson (“his name is not Toady, it’s Ronald”) get it together and are, in her words, “an item”. Thompson has a son but as no wife has ever been mentioned, perhaps he is a single parent. Otherwise this marks a shocking lapse for both of them. But then again maybe all that did happen was a peck on the cheek at the end. Post-mortem: Not much is recalled. The speech that Bristow dimly remembers was apparently delivered at the 2006 shindig. Before: Due to the recession, there is an announcement that the Dinner and Dance is cancelled. Miss Sunman is inconsolable. Post-Mortem: It transpires that the enterprising Sports and Social Club have found an alternative venue. As this venue is the broom cupboard on the second floor, the event is less of a success than they might have wished. Before: Once again there is an attempt to persuade Sir Reginald to attend. Bristow prefers his absence (“I feel he has his eye on me the whole time”).